“Most if not all traditionalists throughout Christian history have rejected the doctrine of innate or natural immortality of the soul as taught by Plato, for a God-given immortality (a biblical idea) which they presumed to be bestowed on humans universally, either by creation or by resurrection (an idea found nowhere in the Bible). Because these traditionalists believe that every human will be immortal in the age to come, they approach the Scriptures with a presupposition that those who go to hell cannot literally be destroyed and pass out of existence. 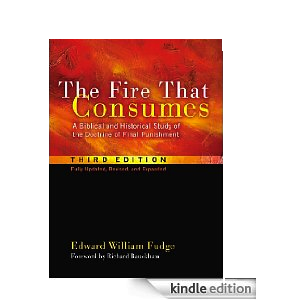 Understandably and inevitably, the traditionalists’ presupposition of universal human immortality entices them to interpret Scripture so that they always arrive at the traditionalist conclusion” (Edward Fudge, “Peterson’s Fourth Reason,” from The Fire That Consumes: A Biblical and Historical Study of the Doctrine of Final Punishment, Third Edition. Eugene: Cascade Books, 2011. Kindle Edition). In my last post, I talked about Tertullian and his view that the word “destroy” does not mean annihilate. I went into great detail about the philosophy and language and used the example of Jesus and the temple in John 2, where the Jews meant one thing with the use of the word “temple,” while Jesus meant another. I think this is the error committed by the Doctrine of Annihilationism (Conditional Immortality). In this post, I intend to respond to Fudge’s attack on traditionalists. While I have aimed to rebut the annihilationist view here, I also have a responsibility to respond to the attacks made by those with whom I disagree. A great apologetic not only involves a good offense, but also a good defense...not just a good defense, but a good offense. Teams can’t win games without both, and the church of Jesus Christ cannot, either. In the quote, Fudge states that the idea of universal immortality is “an idea found nowhere in the Bible.” I want to point out this phrase because, what I am about to show you in this post is that Fudge’s words are quite erroneous indeed. If Fudge is true, what do we do with the Fall of Genesis 3? Was the fall tragic or not? Indeed, I think it was. Have you ever taken time to read through the “Graveyard Chapter” of Genesis 5? It is full of people who lived, had sons and daughters and wives, and then died. “Adam lived...nine hundred and thirty years, and he died” (Genesis 5:5, NASB); “so all the days of Seth were nine hundred and twelve years, and he died” (Gen. 5:8); “So all the days of Enosh were nine hundred and five years, and he died” (v.9); “so all the days of Kenan were nine hundred and ten years, and he died” (v.14); “so all the days of Mahalalel were eight hundred and ninety-five years, and he died” (v.17); “So all the days of Jared were nine hundred and sixty-two years, and he died” (v.18), etc. Genesis chapter 5 is full of individuals who lived many years and then died. The question we should ask ourselves is, “Why is chapter 5 placed where it is in “Geneseos,” the book of beginnings (LXX)? Because it is placed in the historical record of Scripture chronologically after the fall for a reason. “Therefore, just as through one man sin entered into the world, and death through sin, and so death spread to all men, because all sinned...nevertheless, death reigned from Adam until Moses, even over those who had not sinned in the likeness of the offense of Adam, who is a type of Him who was to come” (Romans 5:12-13). But why is this so tragic? Because death was the consequence of sin, not a natural part of the intended human existence. In other words, death is the result of sin, not God’s decision in originally creating man. Death shows us that the creation is stained, polluted, tainted, full of sin and sin’s consequences. Death shows us that things are not the way they are supposed to be. As Cornelius Plantinga has written in his book, “It’s Not the Way It’s Supposed to Be” (See Cornelius Plantinga Jr.’s It’s Not The Way It’s Supposed to Be: A Breviary of Sin for more details). Does it make sense for God to “punish” man with an end to his life if God intended man to have a number to his days before He created him? Does it make sense for God to punish mankind for something that He had already intended to decree to them? No, not at all. A parent punishes a child when he or she does wrong to show that child what it means to lose privileges when parents are not obeyed. How serious is the punishment if all the parent ever wanted to do was torture the child anyway? As Cornelius Plantinga Jr. shows us in his book (mentioned above), life is not the way it’s supposed to be! Life was originally meant to be forever, in the presence of God, surrounded by the glory of God at every turn. Our world, however, is far from what God originally meant it to be. And death shows us that the God of the Scriptures always intended for man to live forever. Immortality was always the plan of God. And this intention of God’s was not removed when sin entered, but it was delayed. Because God always desired man to live forever with His Creator, God never gave up on man...but He did allow His plan to be delayed. Because man sinned against God in the garden, God would allow humanity to die tragic deaths. “And I will put enmity between you [the serpent] and the woman, and between your seed and her seed; He shall bruise you on the head, and you shall bruise him on the heel” (Genesis 3:15). “The God of peace will soon crush Satan under your feet” (Rom. 16:20, NASB). I didn’t understand the Genesis reference until I read the apostle Paul. Praise the Lord for His patience with those of us who study the Scriptures, who often miss many important things that He often tries to explain to us. I think it is safe at this point to see this Scriptural inference up close. First, let’s remember that according to the apostle Paul, death spread to all men (Romans 5:12); if death was a consequence of sin, then the original decree was one of blessing, one of universal immortality. Death could not have been a part of the original decree (otherwise, death was never a consequence to begin with). If death spread to all men, and all men were intended for immortality (death was due to sin), then universal immortality was given by God to humanity in creation. In addition, if the life of mankind did not matter to God, why would He decree that murderers would lose their lives if they murdered other human beings (Gen. 9:6)? If human death was always a part of the original plan, how could it be a result of the fall? In this scenario, if human death existed before the fall of Genesis 3, how serious was the consequence of the fall? I could agree with Edward Fudge about annihilationism if he could show me that universal immortality cannot be defended scripturally. However, I do disagree with the annihilationist camp on this one...because everything we know scripturally points to this immortality inference as a biblical one, indeed. God bless. Maybe I don't understand your question, but it seems to me that if Adam and Eve depended on the fruit of the tree of life, then their continual life would indeed be conditional. I don't understand how this question really affects "conditional immortality." However, I could point out that unconditional immortality is presented as a concept in another place, when the serpent tells Eve "you shall not surely die." However, considering that the serpent is called the "Father of lies" this can be called "the exception that proves the rule." Thanks for your comment. I am sorry to just getting around to this now, some three months later. In any case, the issue of discussion in the post pertained to the sentence of death. What makes the Fall tragic is that Adam and Eve (and humanity) receive a death sentence that was not part of God's original blessing to Adam and Eve in Gen. 1:26-28 when He made them in His image, after His likeness. He created them and blessed them; death, however, was a curse upon them for their sin and disobedience. If the Fall does not occur until Genesis 3, what was the state of Adam and Eve in Genesis 1-2? Were they condemned to die in those texts? Absolutely not. This is the point I was getting at in the post: since death was not an original imposition by God upon humanity at the outset of creation, we can infer that Adam and Eve were originally supposed to live forever. If the above is true as I have stated, we cannot assume that at death, humans simply annihilate and fade out of existence. God's original intention was that they would live forever; how is this dissolved because of a death sentence? Next, what about the Lord's statement to the serpent that the seed of the woman would crush the head of the serpent, and the serpent would bruise the human seed's heel (Gen. 3:15)? I think the text shows us that there is hope beyond the current situation, despite the entrance of sin into God's good world. The seed of the woman and the seed of the serpent becomes a theme that carries through Genesis, when you look at Cain vs. Abel, and then Seth. Seth's time becomes a time in which "men began to call upon the name of the Lord." Another point one could make about Genesis pertains to Enoch. Of all the persons in Genesis, Enoch is the one that does not see death (Gen. 5:24). Why is this placed in the text? It appears that, despite the death sentence, Enoch did not serve it. He was simply taken up into heaven. The same happens to Elijah as he finishes his days with Elisha and passes the mantle of God's prophet on to him. With certain individuals, the death sentence is defied. This is something that annihilationists must grapple with in the text. You speak of the tree of life in the midst of the garden; the problem with this thought, however, is that there were dozens of trees in the midst of the garden. The Lord did not prohibit Adam and Eve from eating any of these other trees--except for the Tree of Knowledge of Good and Evil. The question becomes: if Adam and Eve had eaten from any other tree except the Tree of Life, would they still have lived forever? We have no inclination that they would have died had they not eaten from the Tree of Life. In other words, their immortality was not based on eating from that one tree--and we cannot assume so. I think to posit this is to take the text to a place it does not travel. Thanks again for commenting, and feel free to drop in and pose questions and comments again. God bless.